Red = current long-distance railroad lines into Stockholm. Yellow = original trunk line from the south. Dashed = tunnel. Transport over land had historically never been Sweden’s strong suit. From the Bronze Age through the Vikings to the medieval era and up to the mid 1800’s, waterways had always been the main transportation link. Physical evidence of this phenomenon includes archeological remains from the Bronze Age which are almost always close to ancient waterlines, the Vikings’ worldwide dominance in boat technology and their settlements which were located along waterways, the early Church’s encouragement of road and bridge building in contrast to the heathen method of transport on the water, the waterside location of all noble and royal castles and palaces, and the absence of large towns located any distance from a major river, lake, or sea. Even the lack of certain technologies point to the dominance of water transport—until the Church was established in Sweden around 1000 AD, Vikings lacked the technology to span with stone, and the total absence of pre-Christian stone bridges alludes to the fact that Vikings didn’t need bridges. If the Vikings had needed bridges, they surely would have imported the technology which would have been readily evident on their many widespread travels throughout continental Europe. Not only is Sweden blessed with a long shoreline and an abundance of interconnected inland waterways, but the interior is covered in impenetrable forest and innumerable bogs, and distances between settlements was very long—all of which made transport over land very difficult. Only when the ground was frozen and covered with transport-easing snow did any meaningful transport over land occur. Stockholm’s reliance on water transportation was historically even more pronounced since the city was built on a series of islands. 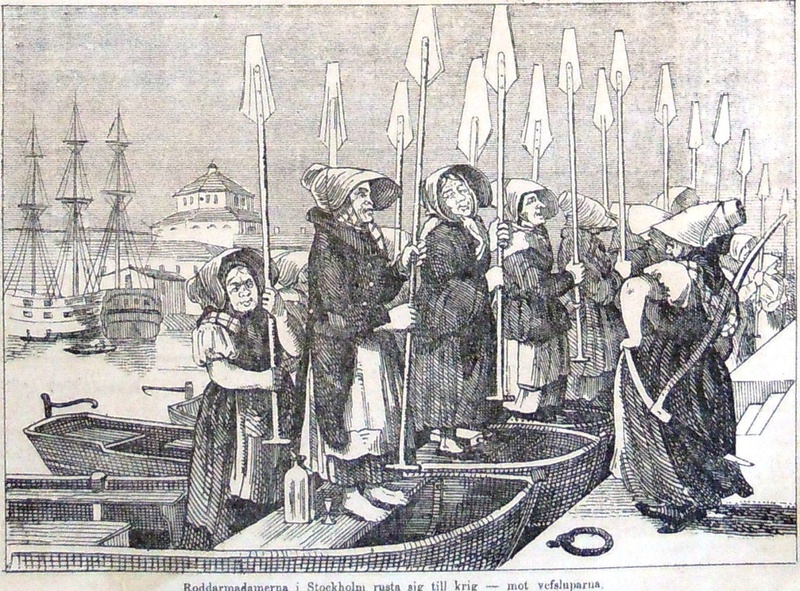 Over the course of modern history, long floating bridges and a few more permanent bridges spanned from landmass to landmass, but the long spans generally meant a shortage of bridges and that most trips over water were by rowboat; rowing passengers from shore to shore was a traditional livelihood for many of Stockholm’s impoverished women. Only in the winter, when ice formed across all of the waterways, was Stockholm openly accessible by foot. 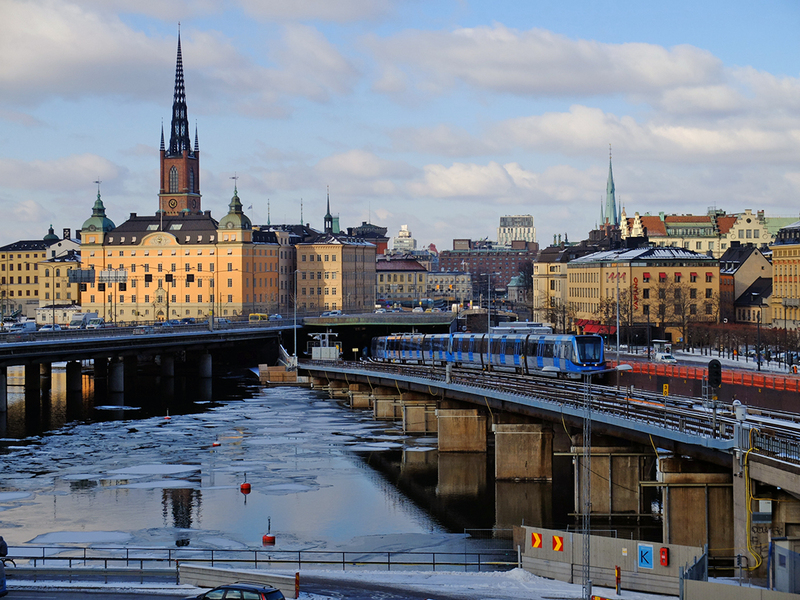 Despite global warming, Stockholm's waterways still ice over, but these days only for a few weeks or max two months. Practically all goods were transported into Stockholm by boat as only the nearest of local farms were within range to transport goods to Stockholm by horse-drawn cart. 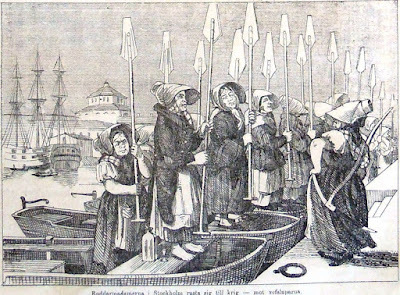 Additionally, nearly all long-distance travel was by boat—nobles sailed to their countryside palaces, diplomats arrived by boat, and seasonal laborers came and left the city during the ice-free months. This complete reliance on boat transport meant that Stockholm was effectively closed off from the world by ice from November to April every year. Very few goods or people traveled to or from Stockholm during the winter half of the year. Compared with England, railroads arrived late in Sweden, but they profoundly changed the country. The railroad opened up the country’s interior and it opened up Stockholm to the world during the winter. The development of a national railroad system in Sweden was astonishingly swift. It only took one or two failed attempts by private individuals and corporations to build a railway line before Parliament legislated (at the King’s behest) a nationalized system in 1853. It was decided that the main trunk lines would be built by federal funds and that smaller, more local offshoots would be financed and run by local corporations with financial support from the government where deemed of national interest. It was also decided that since a well-established and functional network of seagoing infrastructure already existed, the new railroad infrastructure would be focused in the country’s interior. These two fundamental strategies are still felt today as many seaside cities are still time-consuming or impossible to reach by train and as the high-speed routes between Sweden’s major cities are generally trafficked by the national train company SJ while most of the regional routes passing through secondary cities are generally trafficked by smaller transport companies. Only nine years after the first legislation, the trunk line between Stockholm and Gothenburg was completed in 1862. The trunk line between Stockholm and Malmö opened in 1864 and trunk lines heading north and west from Stockholm opened in stages starting in 1871. The extraordinary speed at which these lines were built was in thanks to the huge national investment in the project—70% of the national budget was dedicated to railroad construction in the mid 1800’s. Much of this money was loaned from Germany. Sweden slowly payed off the loan until WWI when Germany’s inflation made the sum owed by Sweden a trifle, and Sweden was suddenly able to pay back the entire loan in a small lump sum. The extent of Sweden's railways by 1866. The red trunk lines were publicly financed and run while the more local black and blue lines were privately funded and run. Additionally, planning projects which today take decades to complete due to the national way of working through consensus building were then decided by single, powerful individuals or committees. The government’s powers of expropriation were far stronger at the time, and large-scale infrastructure projects could be carried out immediately upon approval. The gigantic infrastructure project would never have been completed so swiftly if it weren’t for Nils Ericson who was appointed as project chief by the king in 1855. Ericson, a proven canal-builder, hadn’t really wanted the post but he proved to be an efficient and dedicated engineer and administrator anyway. Routes were rapidly scouted, mapped, designed, and built by Ericson’s teams, and they encountered very little or no interference at the national or local levels. Everyone understood that the railroad was essential to the country’s future economic health, and any NIMBY (not in my back yard) protest that might have existed was too weak to be regarded seriously. While there was comparatively little debate about alternative routes for the national trunk lines, opinions were strong when different routes were being considered in Stockholm. Two main questions seemed to have shaped the debate. First, should the railroad follow Paris’s example with different stations at different sides of the city so that the city’s urban fabric could remain intact? Or should the trunk lines north, south, and west of the city be connected at a central station, regardless of the damage such an intrusion would incur in the city’s fabric? The second question was if the railroad should connect to any of the city’s saltwater ports. The national strategy was to concentrate the new railroad infrastructure to the country’s interior, and all the trunk lines fed into the city from the freshwater side of the city, but wouldn’t it be strategically limiting if the railroad and the shipping industry never connected? Nils Ericson and the city had opposite opinions regarding the first question of several decentralized stations vs. a single central station. The city was of the opinion that a central station was unnecessary and that the intrusion of a railroad in the central parts of the city would cause too much damage. Ericson believed in a central station, but the city temporarily won out. It was decided that the trunk lines would terminate at a northern and a southern station, and that the railroad would not continue into downtown Stockholm. However, Ericson saw this as a short-term solution and he placed the northern and southern stations in such a way that a future connection through downtown could be built. 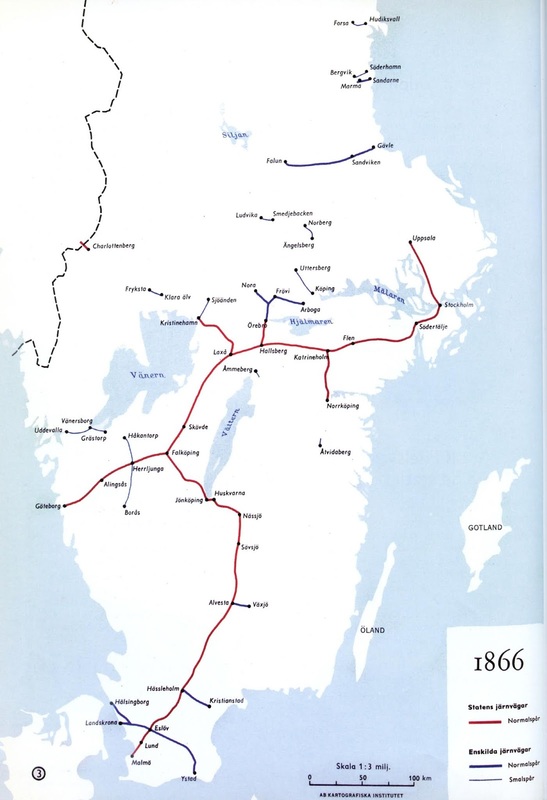 It didn’t take long for the debate on a sammanbindningsbana or “connecting together track” and central station to be renewed; Ericson’s vision of the various trunk lines connecting in central Stockholm was realized in 1871, just 9 years after the first trunk line opened. Ericson won the debate on the second question regarding a railroad connection to one of the city’s saltwater ports—he didn’t believe that the connection was necessary, and all of his proposed stations were concentrated on the freshwater side of the city. Once the mainlines from the south and from the north were in place, smaller connecting lines were inevitably built connecting to the city’s various saltwater ports at Stadsgården, Tegelviken, Danvikstull, Hammarby Canal, and Söder Mälarstrand on Södermalm; Skeppsbron at Gamla Stan; and Värtahamnen on the mainland. These lines were exclusively used for cargo except for Värtahamnen which was a large workplace and ferry terminal relatively far out of the city. Coming from Göteborg to the south, the southern trunk line’s last stop before entering Stockholm proper was Liljeholmen (map 1). 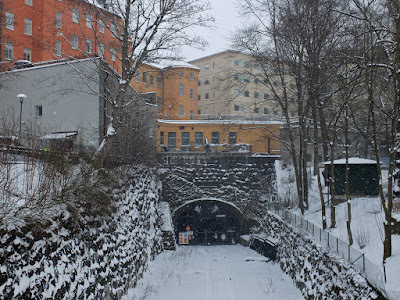 Because land was relatively scarce in Stockholm proper, much of the railroad employee housing, storage, and train car and engine maintenance buildings were placed just outside of the city in Liljeholmen. A large candle factory was already located at the water’s edge in Liljeholmen, but the railroad drew many more industries to the area. Liljeholmen's railroad history is still visible. 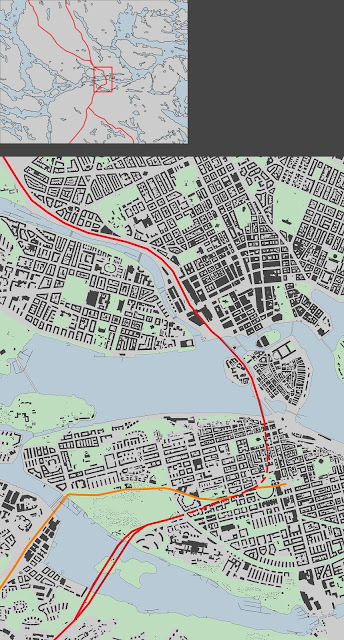 The Southern trunk line entered Stockholm from Liljeholmen over a man-made embankment (map 2) over the Årsta Bay and to the island of Södermalm. A narrow channel through the middle of the embankment allowed for water to still flow from one side to the other and a swing bridge allowed for boat traffic. 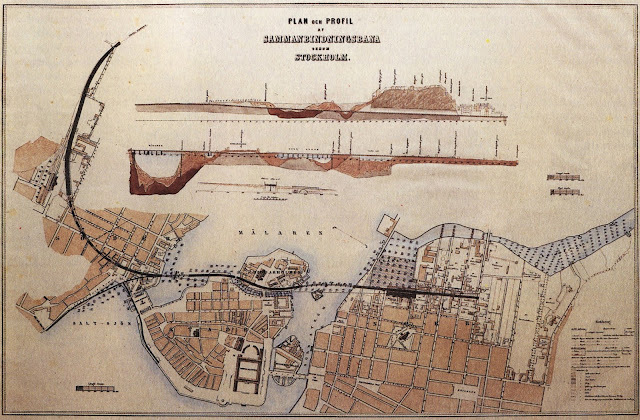 This was a relatively easy approach—although the embankment across the bay turned out to be an enormous amount of work requiring enormous amounts of fill, very little blasting was required on Södermalm for the route. 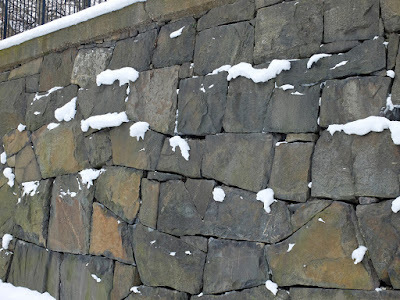 Part of the original railroad embankment from Liljeholmen to Södermalm still exists; it is used as a boat dock. From Årsta Bay, the tracks crossed farmland and followed a natural valley into the interior of the island (map 3). From Tanto toward the interior of the island. When Ringvägen was built, a bridge was built so that the road could cross over the tracks. Maria Bangata is now a walking and biking path, but it was the original railway through central Södermalm. The draining of Fatburen Lake provided a large, unbuilt area for the Southern Station (map 4) which consisted of a station building, a house for the Station Chief (map 5) and another for the Track Master, a hotel, and a host of industrial sheds for the handling of goods. The Station Chief's dwelling is the only surviving structure from the original Stockholm Southern Station area. 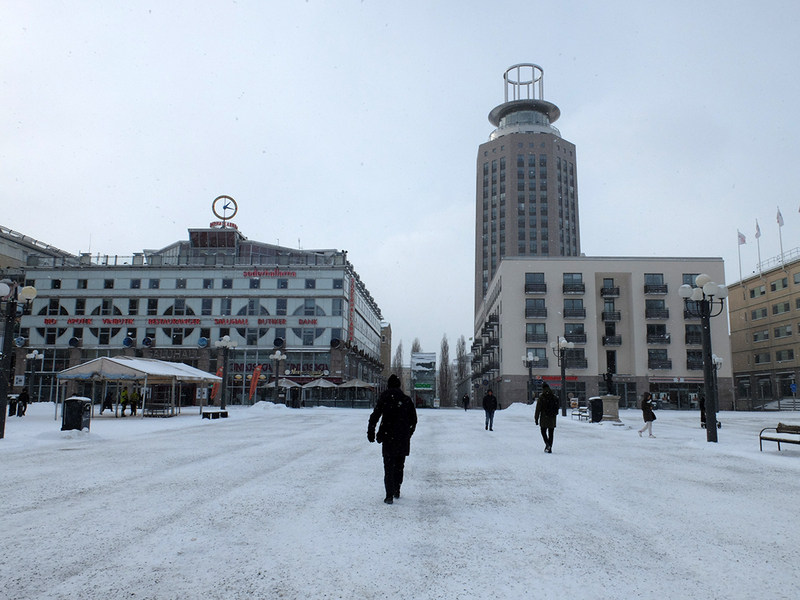 This area was known as Södra Bantorget or “Southern Railway Square” (map 4). Because Ericson was convinced that a central station would soon be built in Stockholm, the Southern Station building was built as a temporary building in wood rather than as a grand station in brick. Stockholm Södra Station in the 1860's. While the Southern Station was built to be temporary, the stonework lining the sunken tracks was meant to last. Taking advantage of the new transportation link, industries and warehouses of all kinds soon replaced the farmland along the tracks. Neuhaus's map of Stockholm from 1870. Stockholm Södra station is still on the edge of farmland. In 1871, the rail link connecting the Southern Station to the Central Station was completed, but due to the convenience of the Southern Station as both a passenger and goods terminus, the Southern Station area was not immediately demolished as Ericson had originally planned. Instead, tracks and station remained relatively unchanged until the 1920’s. Until around WWI, all sea traffic between the saltwater Baltic Sea and the freshwater Mälaren Lake was funneled through the lock at Slussen (map 6). For many reasons, not least of which was inconvenience to train traffic which was required to halt every time a boat came through the lock, it was decided that a better solution was needed. It was decided in 1914 to build a bigger lock with more capacity through Skanstull (map 7). Now that the majority of boat traffic would be routed south of Södermalm, the small, slow swing bridge at the embankment from Liljeholmen to Södermalm was no longer sufficient to keep both boat and train traffic in motion. The southern trunk line now bypassed the facilities at Liljeholmen, and over time most of the railroad-related buildings were demolished, though the tracks were still used by the local industries until the early 2010’s. Today, although a few industries are still located in the area, most of the formerly industrial area has been rebuilt as apartments and offices. 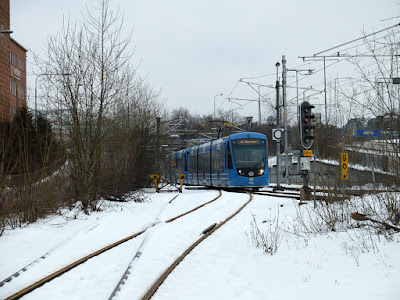 A small portion of the tracks is still used for the new Tvärbana tramline which opened in 2000, but most of the other evidence of railroad activity is sure to be demolished in the near future. The Tvärbana tram uses some of Liljeholmen's original tracks. Much of Liljeholmen’s railroad activity—maintenance, the handling of cargo, warehouses, etc—was replaced by newer, bigger facilites at Årstaberg, just south of the Årsta Bridge. Cargo transfers and warehouses are still quite visible at Årstaberg. Once this area was outside of town, but today, it is a vast no-man's land in the middle of the city. The embankment over Årsta Bay was also demolished though a small section on the Södermalm side remains and is now used as a dock for small, private boats. On Södermalm, the tracks were re-routed to the east to connect up the new Årsta Bridge with the Southern Station and the track to the Central Station. 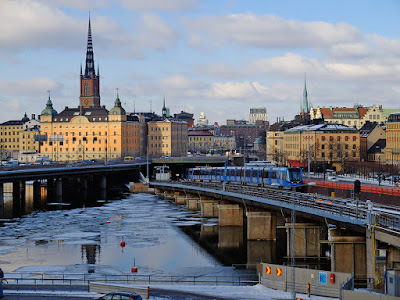 From Årsta Bridge toward Stockholm Southern Station. 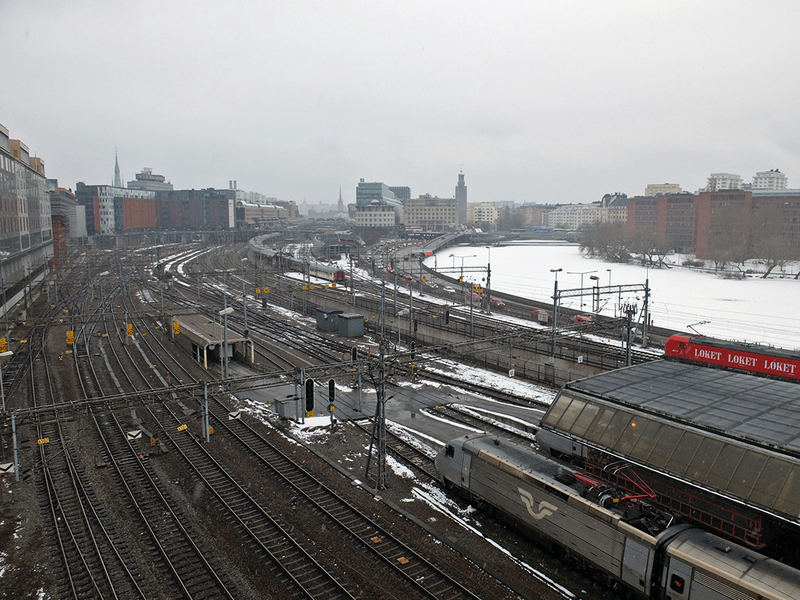 From Årsta Bridge toward Stockholm Southern Station. In the 1980's and 90's, the tracks were covered over by housing developments, some of which are unfortunately very ugly. and the Konsumentföreningen’s warehouse and production facility for deli goods remain. The original route through Tanto to the Southern Station was demolished, and over time the city fabric surrounding the tracks was also demolished and the land was rebuilt with apartment buildings in the 1960’s. Apartments built on the edge of Tanto Park. Many of the factories further inland closed and the land was reused to build apartment buildings in the 1980’s. However, a few industrial buildings such as the Tobacco Monopoly, now converted into apartments and offices, remain. In the 1990’s, the old rail bed was converted into a wa.king and biking trail. Tobaksmonopolet or Tobacco Monopoly, walking/biking trail in the old rail bed to the left. The original Southern Station remained in use for passenger and goods traffic until 1926 when it was demolished in favor of a new station a bit farther west. The newer station was better situated for both the link to the Central Station as well as for the rerouted southern trunk line over the Årsta Bridge. This newer Southern Station was in use until 1970 when it was demolished. 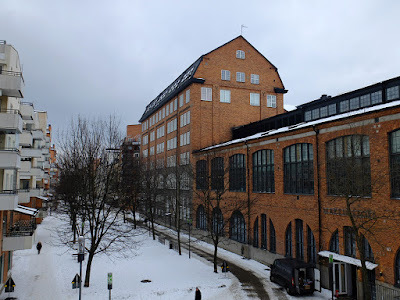 Only the Track Master Residence remains of the original station, and the original station area at Södra Bantorget became in time Medborgarplatsen or “Citizen Square” with a new community center with indoor swimming pools, a theater, and a library which was built in 1939. The entire Southern Station area (map 9) was re-envisioned in the 1990’s. I will cover this in more detail in a future post, but the gist of it was that the mostly abandoned industrial area was demolished, the railway was covered over, and the entire area was rebuilt with apartment and office buildings. The Stockholm South station (or Stockholm Södra) is still in use as a commuter rail station today. 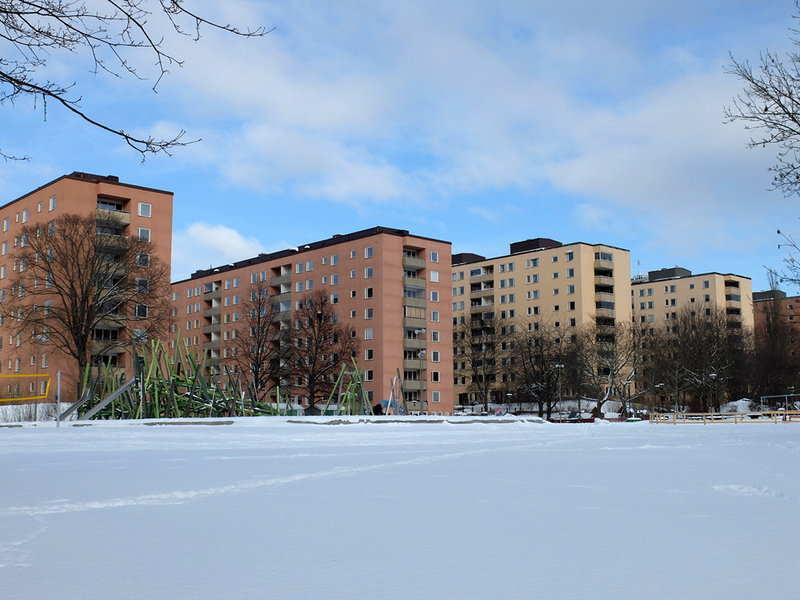 The Stockholm Södra development from the 1990's was built over the tracks. Now the railroad is mostly hidden from view (left), but a few openings for ventilation as well as some abnormally hefty structural elements give away the railway's location (right). 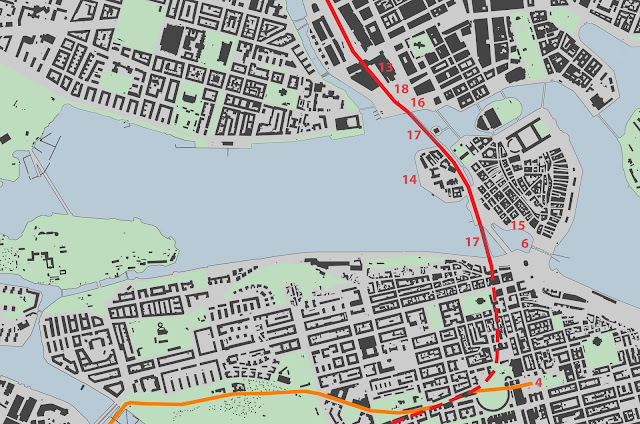 The Northern Trunk Line truncated Karlbergs Slott’s garden (map 10) and approaches the city on a combination of “reclaimed” swampy land and new infill along the edge of what was formerly known as Klara Lake. Today, the body of water has been so encroached on by the train tracks that it is known as Klara Canal (map 11). Stockholm North Station opened in 1866, but like the Southern Station, Nils Ericson didn’t invest in a grand station house since he was convinced that the Northern Station would be temporary. Instead, an existing wooden building was appropriated for the use. Auxiliary buildings such as a train car shed and a coal shed were built in such a cheap and temporary manner that they weren’t even given foundations. Given the swampy nature of the land, they sunk immediately when filled with train cars and coal. 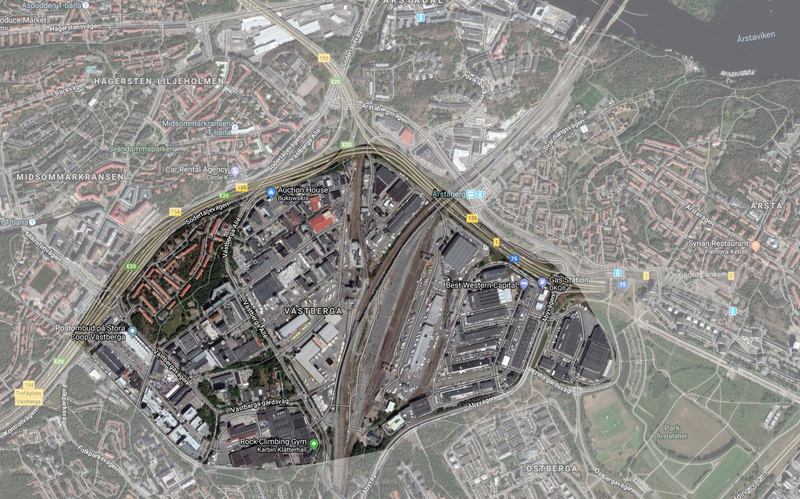 The open area at the station became known as Norra Bantorget or Northern Rail Square (map 12). Even though the railroad function is long since gone, the square retains the name today. In contrast to Medborgarplatsen at the Southern Station, Norra Bantorget has not been paved over and remains a green park. Unlike the Southern Station, the Northern Station lost its station status once the Central Station (map 13) opened in 1871. Being only a couple of blocks from the Central Station, the Northern Station became the cargo station. The original temporary buildings were quickly replaced and in 1893 the railroad invested in a brick cargo office building. 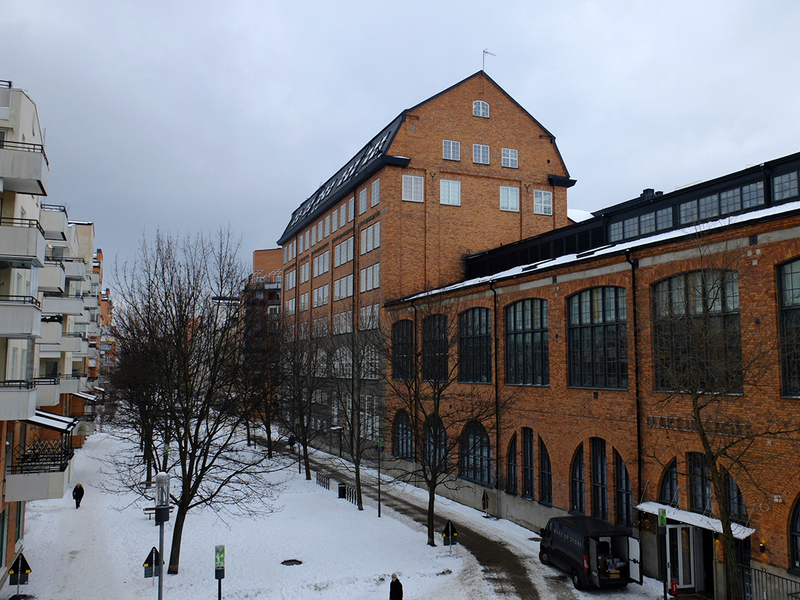 This office is one of the few early railroad-related buildings still standing in Stockholm; today it is still used as office space. Both sides of the railroad tracks were once lined with copious numbers of industrial buildings. Sheds and warehouses for the handling and storage of cargo were abundant. Fruit, vegetable, and meat markets were established to take advantage of the fresh produce and meat. There were a number of service buildings for train cars and engines. The raw, industrial nature of the areas surrounding the railroad tracks was apparent well into the 1960’s when wide roads replaced the warehouses and sheds. The tide of overzealous road building turned in the 1980’s and 1990’s when the uber-central location of the roads and railroad tracks around the Central Station began to be re-envisioned into offices, conference centers, hotels, apartment buildings, and a bus terminal. Slowly but surely, the highways and railroad tracks are being placed in tunnels and the real estate is being developed into a cityscape. The next phase under investigation involves decking over the entire Central Station area, creating workplaces for 20,000-50,000 people. Left: This former railroad area (to the right in the image) was built out as housing in the 1990's. Right: The entire area in orange is slated to be built over soon. The railroad tracks will remain, but they will no longer be open-air. Ericson was correct and the northern and southern trunk lines were almost immediately connected through downtown to a Central Station (map 13). What he didn’t correctly predict was that the Southern and Northern Stations would live on for many decades—Stockholm Södra is still a commuter train stop and Stockholm Norra was used for cargo at least until the 1920’s. These drawings from 1870 shows the Sammanbindningsbanan's route and section. From the Southern Station area (map 4), a tunnel was dug through the granite bedrock under the existing city fabric out to the water’s edge at Slussen (map 6). This was, according to me, the most sensitively executed section of the sammanbindningsbana or "connecting together track." However, this "sensitivity" was due more to topographical issues than to a desire to preserve the existing city fabric. Tunnel from Stockholm Southern Station toward Lake Mälaren. A bridge over Lake Mälaren from Södermalm to the canal between the islands of Riddarholmen (map 14) and Stadsholmen (map 15) was then built to carry the tracks. The bridge originally had an opening in the middle so that boat traffic could pass by, but this need was muted when the lock at Skanstull and the Årsta Bridge was built. The tracks between Riddarholmen and Stadsholmen are known as the Gettingmidjan or Wasp’s Waist because while tunnels and bridges can be expanded, laying additional tracks here is impossible without destroying 800 year-old buildings. Now, only a very narrow and desolate canal known as Riddarholmskanalen separates the two islands. Wasp's Waist (Gettingmidjan) between the islands of Riddarholmen and Stadsholmen (Gamla Stan). From the Wasp’s Waist, another bridge connects the tracks to the mainland at Tegelbacken (map 16). This bridge also had a section that opened for boat traffic. Northern Centralbron between Riddarholmen and Tegelbacken. From Slussen to Tegelbacken, the series of bridges over Lake Mälaren and between the islands of Riddarholmen and Stadsholmen is collectively known as Centralbron or Central Bridge (map 17). The tracks at Tegelbacken were at street level until 1948 when traffic chaos forced planners to find another solution, and the street and tramline was dug under the train tracks. Cyclists, pedestrians, and local traffic go under while trains, the subway, and the highway go over. Originally, there was a verdant park, Järnvägsparken or Rail Road Park (map 18), between Tegelbacken and the Central Station. Most of the park was taken over by the highway in 1946 and in the 1950’s, the remaining trees and bushes were destroyed for subway construction. The park was never replanted and today it is a sad leftover space despite a recent attempt to spruce it up with new cobblestones and a new sculpture. It takes more to create a park under a highway than cobblestones, a few trees, and a sculpture. The extension of the railroad from the Northern Station to the Central Station was much more straightforward than at Stockholm Southern. Up north, the tracks were merely extended past the original station. As additional tracks were needed to increase capacity for cargo and passenger traffic, more and more land was built out into Klara Lake to accommodate them. There was considerable debate and protest about the brutal way that the Southern trunk line was connected to the Central Station. Parliament was at first against the link for several reasons: the cost wasn’t justifiable since it the southern and northern stations were within walking distance of each other, boat traffic would be hampered, and the city’s beautiful waterways were at stake. While few relished the idea of Centralbron, the idea quickly won traction and funding. 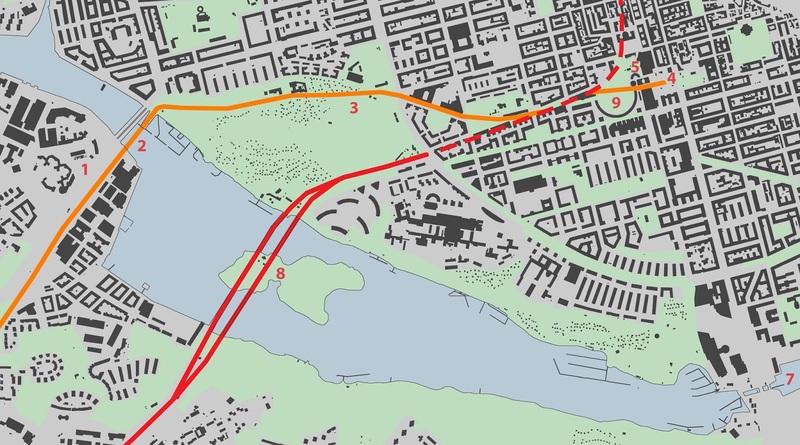 As far as I can tell, no serious alternatives to Centralbron were ever discussed. I’ve mentioned above that both the Southern and the Northern Stations were by design less than impressive. In contrast, no expenses were spared on Stockholm Central Station (map 13). The station was so large that it was only exceeded in size by the Royal Palace which has 1430 rooms. Stockholm Central was designed by Chief Railroad Station Architect Edelsvärd in the Neo-Renaissance style and it opened in 1871. The facade was originally more decorated with statues but it was streamlined in the 1950’s and much of the sculpture was removed. The original Stockholm Central Station, interior. Today, it’s hard to imagine that the original Central Station seemed so huge because these days it feels like a mere vestibule to the “real” station. In the 1920’s, the train hall was demolished and replaced by a huge waiting hall—although the giant waiting room is designed to look like a train hall, it never actually had trains under its roof. The waiting hall is decorated with National Romantic wall paintings which depict destinations from Southern to Northern Sweden which can be reached by train. Both Vadstena Castle and the Swedish mountains can be reached by train. The next big change came in the 1950’s when the station’s basement was dug out to accommodate a pedestrian tunnel to safely reach all of the tracks as well as a new central subway station. A hole was cut out of the waiting hall floor to visually connect the pedestrian tunnel. Stockholm Central Station--hole connecting the waiting hall with the subway entrance level. In the 1960’s, Stockholm’s commuter rail network was expanded. The commuter rail trains used the same tracks and platforms as the long distance trains, but a new commuter station entrance was built on the west side of the Central Station. This entrance is much higher than the main station entrance because it connects to a large road which crosses over the railroad tracks. In the 1980’s a huge office and conference center known as Stockholm’s World Trade Center was built over the tracks. The bottom level of the World Trade Center is a huge long-distance bus terminal that connects underground to the Central Station. Left: From the street, the World Trade Center looks like the office and conference center that it is. Right: Only from the side along the train tracks can you see the building's bus station. With the completion of the bus station, Stockholm Central became the junction not only for trains but also for the subway system, the commuter train network, and long distance buses. The interior of Cityterminalen, Stockholm's long distance bus station. Sure beats the average Greyhound station! As I mentioned at the beginning of this post, Stockholm had been completely reliant on ice-prone waters for freight and passenger transportation before the railroad. The railroad opened up access to Stockholm year-round and even gave Stockholm access to inland Sweden. This was a profound change for Stockholm, but I think that the railroad spearheaded and represented several other equally important changes in the city’s landscape. As the “stations” disappeared from the waterfront, it was no longer important for pedestrians to be able to easily access the shoreline. With the railroad, the waterfront began to be taken over by transportation infrastructure. In an effort to keep as much of the city fabric intact as possible, the trunk lines were placed on infilled land at the water’s edge. This trend continued during the 1950’s to 70’s as more and more larger and larger roads were built along the shore on what used to be water. The waterfront no longer belonged to people and pedestrians but to trains, cars, and infrastructure. The railroad set the precedent for infrastructure at the water's edge. The railroad also set the precedent for Stockholm that cheaper, easier infrastructure solutions were more important than preserving the city’s beautiful panorama. Cheaper, easier infrastructure solutions were also more important than pedestrians’ convenience as the ever-expanding railroads and highways became major barriers and inconveniences in the cityscape. Noise and air pollution were accepted as necessary evils. 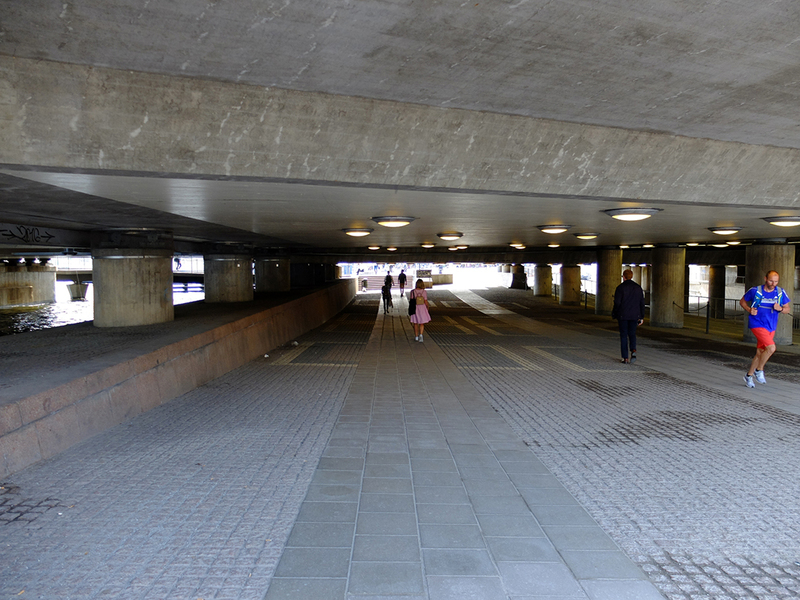 Infrastructure was allowed to infiltrate and dominate the pedestrian’s experience of the city. The railroad set the precedent that it is ok for infrastructure to change and dominate the cityscape, even in historic areas. Additionally, the railroad set a precedent of blasting through bedrock. Inconvenient hills and cliffs that had been negotiated for centuries were simply dynamited away so that the tracks could be laid at the right gradient. Geography was no longer a major determinant in the development of the city—instead the land became clay which planners molded to their own needs. Yes, Stockholmers had been lightly altering the geography to suit their needs for centuries by “reclaiming” land at the water’s edge and by chipping away at troublesome ridges, but these changes had been slow and incremental and relatively localized. With the railroad, geography began to be altered at a literally explosive rate and extent for the sole purpose of transportation. Again, cheap, convenient infrastructure trumped respect for the city or for the land. The railroad set the precedent that blasting through the bedrock is an acceptable solution to geographical hinders. Railroads brought a new speed into life, and dynamite brought a new rate of change to the city. Historically, extensive changes in the cityscape took centuries to complete so that one generation hardly noticed the difference. Suddenly, the entire city was significantly altered within a decade. The railroad also brought a new scale to the cityscape. Before the railroad, the city’s only “larger than life” structures symbolized the Crown and the Church. The railroad, with its gigantic Central Station, its lofty bridges, and its miles-long embankments was the first profane structure to overshadow human scale to an almost dehumanizing extent. The pedestrian human ceased to be the scale figure which city planning was based upon; not only would structures and infrastructure begin to dominate the cityscape, but distances would now be framed in terms of railroad velocity instead of the pace of a pedestrian or horse. The Årsta Bridges clearly demonstrate the scale of the 1700's vs. the scale of the early 1900's. And these changes spurred by the railroad are still visible and physical presences in today’s cityscape. The changes didn’t take long to complete, but like the toll fences, many of the boundaries created by the railroad are still unreconciled. 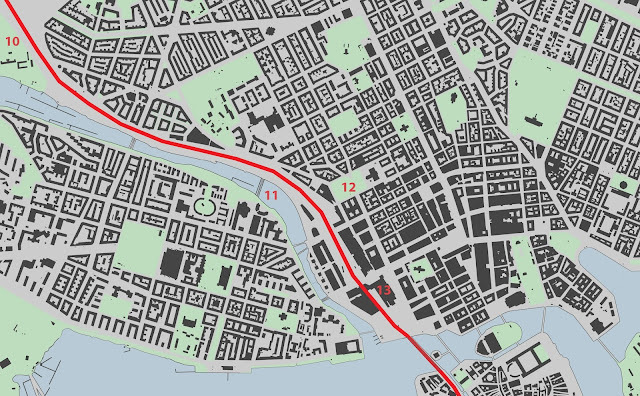 In addition, large swaths of land along Klara Canal and at Liljeholmen and Årstaberg became wastelands of cargo infrastructure, completely inaccessible to pedestrians or to city development. 150 years later, the wasteland at Liljeholmen and along Klara Canal are slowly being healed over, but Årstaberg remains inhospitable. The cargo wasteland at Årstaberg. While I firmly believe that the railroad’s storming of Stockholm resulted in many negative and unfortunate infrastructure decisions and additionally set the precedent for countless negative decisions in the future, I still love the railroad. I love the romance of traveling by railroad, I love the ease and convenience of traveling by railroad, I love how safe the railroad is in comparison to other modes of transport, I love how environmentally sustainable rail travel is. But most of all, I love the railroad for how it, in comparison to highways, encourages city density and public-transportation-oriented planning. Ironically, the railroad saved the city and the railroad’s subway and commuter-train offspring make the city livable. So while I don’t wish away the railroad, I do wish that it had been a bit more respectfully inserted into Stockholm’s cityscape. Like entirely in tunnels!